WiFi Problems – WiFi Signal Black Spots. Extend WiFi Coverage At Your Home, Office or Anywhere. Connecting Two Buildings Share Computer Network and Internet Connection. Latest apps and the information they gather. Latest Apps. Did you ever wonder why you are receiving emails, texts, banner ads and even phone calls from total strangers? It could be the latest apps you installed. The app market is massive today. Did you ever wonder why people develop apps and give them away for free? But are they free? Most apps request permission to data on your device. The latest apps want to know your contact details, all your contacts and most want to know your location. They want to know your contact details and location for marketing. This information has value to the developer as does your contacts list. The market for further marketing is huge and worth money. Your details and your contact details are worth money. Add your location to this and marketers can push product information and suppliers in the location to your devices. How Can App Developers Make Money? The latest apps create a demand for their app for several reasons. Google, Facebook, Snapchat, Twitter and app developers monitor you. While searching Google looking for WiFi, the chances are that you will be shown location close to where you are. You might think that this is coincidental but don't fool yourself. The chances are that your location settings are on and Google know where you are. Each company can sell advertising to businesses based on your location, interests, and behavior as they keep an eye on you while you move. Although you never typed in where you want WiFi they know. So the developers also use this information to create the income to run their services. You can turn off the location on your device yet, on the other hand, you will loose use of things like maps and directions. There are ways restrict each app from accessing the data on your phone. Android and IOS have similar settings for doing this. Although once you turn off the permission you will lose some features for the app. We will show you how to change the permissions for devices in the links below. 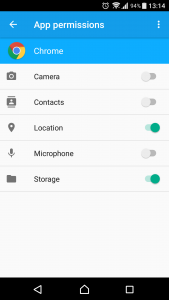 How To Change App Permissions On Android click here. Change App Permissions on IOS click this link. More from us click here. Air WiFi. 65 Fairways, Rathfarnham, Dublin 14. D14 W577. Ireland.